WEST PALM BEACH, Fla. – All Islamic State-owned territory in Syria has been eliminated, President Donald Trump announced Friday, though officials said sporadic fighting continued on ground between coalition forces and the group's holdouts. The IS "territorial caliphate has been eliminated in Syria," White House press secretary Sarah Sanders told reporters aborted Air Force One. US. Officials with the situation in Syria said again Friday that the Syrian Democratic Forces were still battling the last remaining IS fighters who were held up in tunnels along the river cliffs in Baghouz and have refused to surrender. Officials said the SDF has not Associated Press journalists in Baghouz, in eastern Syria, said coalition fighters were still conducting mop-up operations in the village after seizing and encampment Tuesday where the extremists had been holed up for months. SDF spokesman Kino Gabriel told AP earlier Friday that there were still fighters and women and children in caves near Baghouz. He said final operations were ongoing and there appeared to be several hundred people still inside. Other SDF officials said the camp was full of corpses, and that some civilians and IS fighters were still handing themselves over. At least two airstrikes were carried out on the bag earlier Friday, sending black smoke rising in the village. According to the officials, the SDF is moving slowly and carefully, and is willing to wait out the IS fighters who are out of food and low on water. Sanders customs reported that Trump was briefed on the development by acting defense Secretary Patrick Shanahan who was traveling with him to Florida. "We got the information from the DOD," she added. 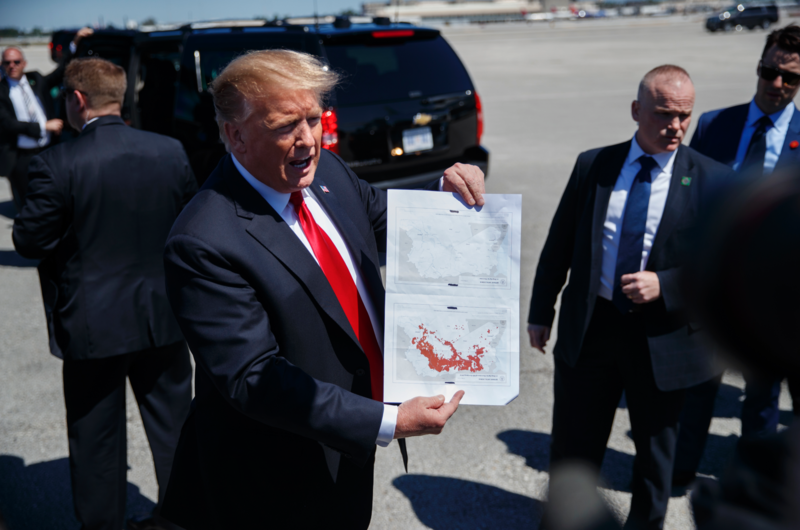 Trump showed reporters on map of Iraq and Syria that showed the terror no longer controlled any territory in the region. "Here's ISIS on Election Day," he said, linking coalition gains since then to his presidency. He pointed to a swath of red area signifying the group's previous territorial gains, and then to one without any red, "Here's ISIS right now." But Trump appeared to be overstating his administration's contribution to the anti-IS fight. A close-up of the map showed that Trump was displaying a group's footprint at a high-point in 2014, not Election Day 2016, at which point the US-backed campaign was well underway. Trump has been teasing The victory for days, most recently on Wednesday when the milestone would be achieved by that night. But even after Baghouz's fall, there is a scattered presence of sleeper cells that threaten to continue an insurgency. The militants have been putting up a desperate fight, their propaganda machine working on the brink or collapse. The battle for Baghouz has suffered for weeks and the encampment had proven in major battleground, with tents covering foxholes and underground tunnels. IS members. Over past weeks they have been flowing out, exhausted, hungry and often wounded. The sheer number who emerged – nearly 30,000 since early January, according to Kurdish officials – took the Syrian Democratic Forces by surprise.